Independent fuel firm Seaoil is offering a rebate program to customers who will pay fuel purchases with their credit cards this Christmas season. 1. Buy 20 liters of Extreme 97, G5 X-treme or G5 Unleaded in one go for a P20 rebate, and get a P1 discount for every additional liter charged in a single receipt. This means a customer who buys P1,500 worth of Seaoil gasoline at P50 per liter will get a P30 cash rebate. 2. Purchase 20 liters of BioXceed diesel and get a P10 rebate plus a 50-centavo discount for every additional liter bought. 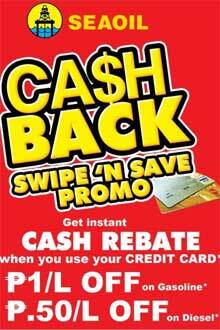 Seaoil's CashBack Swipe 'N Save promo runs until December 31. Seaoil is an aggressive oil firm that has been expanding nationwide. It recently opened its 200th station in Cebu.